A legal estate is created whenever a taxpayer dies, and it terminates when all of its assets have been distributed to beneficiaries. If the estate earns income, it may be taxed by the Internal Revenue Service (IRS). The executor of the estate (or other fiduciary if no executor has been appointed) is responsible for filing IRS Form 1041 on behalf of the estate and paying any tax out of the assets of the estate. Gather together the estate's financial records, including records of any distributions to beneficiaries. Download IRS Form 1041 (see Resources section) and the accompanying instructions (see References section) and print them. Figure the estate's total income during the tax year. Common sources of income include rents, corporate dividends, interest on loans, business income, and royalties. If the estate's total income is at least $600, an estate tax return must be filed. Figure the total deductions that can be subtracted from total income to arrive at taxable income. Estate administration expenses such as executor and legal fees may be deducted, along with taxes, distributions to beneficiaries, and qualifying charitable donations, among other items. Any amount remaining represents the estate's taxable income. If the estate's taxable income is greater than zero, Form 1041 must be filed even if the estate earned less than $600 during the tax year. Calculate the estate's total tax by using its taxable income along with the tax table contained in the Form 1041 Instructions (see References section). Subtract from this amount any taxes already paid (through withholding, for example), to arrive at total tax due. Report the estate's income, gains, losses and accumulated income on Form 1041, along with the amount of employment tax on wages paid to the estate's household employees (if any). Complete Schedule K-1 for each estate beneficiary in order to notify them of their tax liability on their share of the estate's distributions. Submit Form 1041 along with any tax due to the appropriate IRS Service Center (a list is contained in the Form 1041 Instructions), along with Schedule K-1 for each beneficiary. Copy each Schedule K-1 and send each beneficiary the copy applicable to him. Carnes, David. 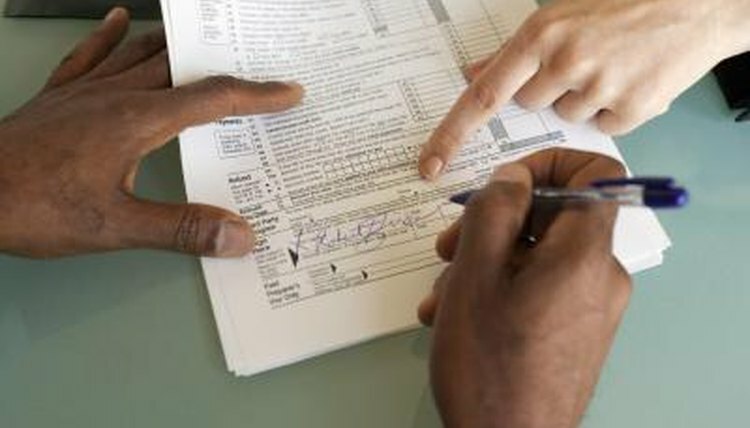 "How to File an Estate Income Tax Return." , https://legalbeagle.com/5821928-file-estate-income-tax-return.html. Accessed 18 April 2019.